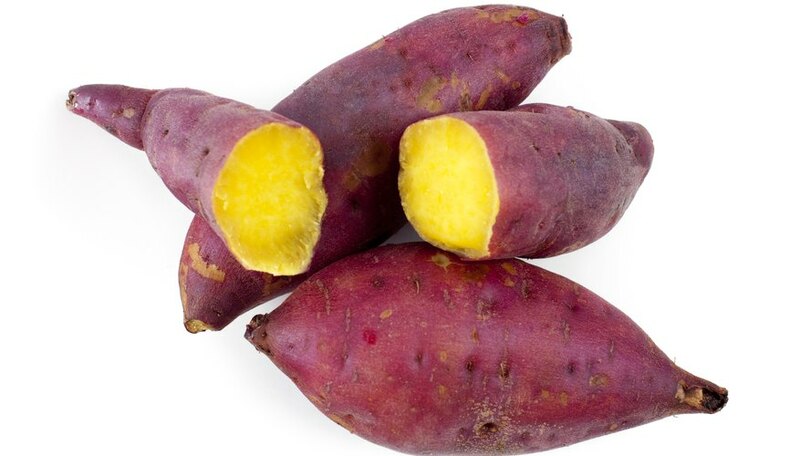 Sweet potatoes (Ipomoea batatas) are edible roots that come in a variety of types. Most gardeners with a reasonably long growing season can add some of these nutritious roots to the garden without too much trouble. Harvesting sweet potatoes requires digging them out of the ground. To make harvesting a bit less strenuous, try growing sweet potatoes in raised beds or containers where they are easy to reach. Typically you’ll want to harvest sweet potatoes once the roots are about 1 1/2 to 2 inches across. Most varieties are ready to be dug out about 100 to 140 days after planting. Leaves may have started to turn yellow, but vines won’t die to signal harvest time. Try to dig them up on an overcast, dry day since both rain and direct sunlight can harm them. Get roots out of the ground before the first hard frost or they may be damaged and become inedible. Use a shovel or a spading fork to carefully dig into the hills or ridges around the sweet potato vines. Start about 2 or 3 feet away from vines to reduce the chances of damaging any of the crop while digging. Loosen the soil in the general area, moving closer and closer to the plants until you begin to see sweet potatoes. Dig deep enough to be sure you’re getting under the deepest of the roots. Remove as much excess soil as you can. Lift the potatoes out of the ground, cutting them from the vine if necessary. Let sweet potatoes lie on the ground and cure for several hours immediately after harvesting. Do not allow the sweet potatoes to lay on the ground overnight because cool nighttime temperatures and moisture can damage the potatoes and don't wash the potatoes before storing. Sort out any damaged roots to use immediately, and move the rest to a storage room with a high level of humidity kept at a constant temperature of close to 80 degrees. Keep potatoes there for between 10 days and two weeks, and then move them to a cool and dry storage area with a temperature of about 55 degrees. You should be able to store them for up to four months. Avoid handling them too much to avoid bruising. You don’t need to wait until the end of the season to harvest some of the sweet potato crop to enjoy right away. Carefully dig into the side of the ridge the same as you would to harvest mature sweet potatoes, but be careful not to injure the plant. Remove some of the small roots and put the soil back in place, leaving the rest to continue growing.